Less than a week before Mr. Obama walks into the sunset–or at least walks out of the White House– further damage to US/Israel relations is still possible. Beyond a shaky relationship that has been crumbling over the past eight years, Israel is a risk once again because 72 world leaders are being manipulated by her fiercest foes. 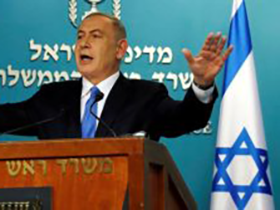 They are about to meet in Paris on January 15 and decide on the fate of the tiny Jewish State. Like a thorn in the flesh of our global village, according to these leaders, Israel must accept and recognize Palestine for her [Israel] own good. Neither Mr. Netanyahu nor Mr. Abbas will be attending the Paris Conference. Mr. Abbas isn’t interested in negotiations (nothing new here) and Mr. Netanyahu, while opened to negotiating, will only do it with no preconditions AND in person with Mr. Abbas. But the world has “a wonderful plan for Israel” even if it leads to its destruction!